Neko, the neighbourhood protector is seen here doing what it does best, taking a nap. I wish I have time for naps and sleep. There’s so much things to do everyday. This entry was posted in Neko, Otaku. Bookmark the permalink. LOL! neko looks like a centipede! I want to see Bobby Lee sleep in that position. they have good life.. Sleeping all day long.. when the time comes, the cat woman with tons of neko food comes and feed them.. I want to hug it, no really, and I want to nibble that neko really hard. Pets don’t have to do much, and they have hardly anything to worry about. My sister on the other hand comes back home stressed out after more than 12 hours of work and has to get up again at 8 on the next day. With that kind of stressful life, who wouldn’t want to sleep like that cat? What do you think Neko is dreaming?? Are you sure it’s not just licking itself? Mikuru is protecting the cat? That’s a very cute picture! yup cats are so cool. u never knew what they are thinking. nope neko needs no protector. neko is the protector. yup, flickr is amazing. it actually makes photos clearer when resized. in my bag actually. neko continues sleeping. I want a Shamisen-looking cat! Alafista > NOONE BEATS UP NEKO. NEKO BEATS YOU. Wanna be sleeping that peaceful..
everyday is just like climbing to Everest,lol. ps. Can you add me on your blogroll please? I thought it was trying to lick its crotch before i read the title and went “Oh!” Neko-chan is so cute! LOL! damn right u are! no of course not. neko is pretty tamed. u mean curl up like a ball? Tight schedules, endless work, stupid public transport and a bloody timetable that dictates a report to work by 0800HRS plus OT at the end of the day on a three digit pay. A slice of S’porean NSF lifestyle. I would be happy if I can ever achieve seven hours of undisturbed sleep on a weekday. My dog looks like this about 80% of the time. nahh.. i meant slping as peacefully as it does.. xD..
NSF can never sleep full 7 hours. i used to wake up everyday at 5am so as to report to camp at 7am. traveling time to my camp alone takes 1 hour. neko didn’t even wake up when I pat him on its side. lol so many comments about a cat. ^^ I myself am more of a dog person. 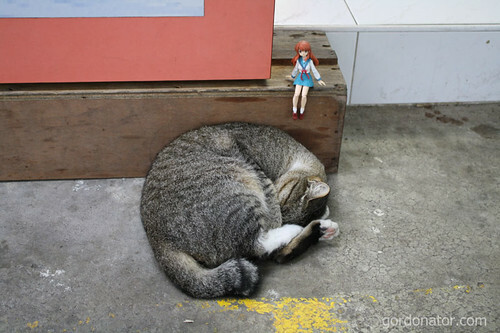 ^^; but I’m curious how were you able to put Mikuru there without stirring the cat awake?